Moving time: 5 hr 40 min. Wind: Winds were only an issue toward the last five miles when we had a brutal cross wind. If the last two days were big days then today was a truly monumental day. 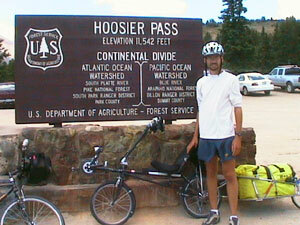 Joe and I rode to the highest point on the trail: Hoosier Pass at 11,542 feet. It is a very large accomplishment and a huge psychological barrier to overcome. Frankly, it was much easier to reach than I thought it would be. Acclimating to the high elevation was not difficult to do either and I didn't feel any different riding at 11,000 feet than I did at sea level. The advantage with touring is that we slowly gained altitude to this point rather than driving or flying into the local area. Last night was very cool. The temperature dipped down to 35° F but warmed up quickly once the sun rose above the horizon. Even still, at this elevation the days don't get very hot. 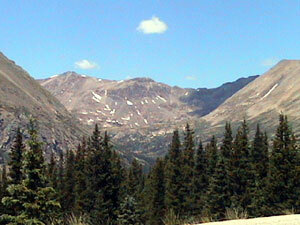 Breckenridge typically sees high temperatures in the 70° - 80° F range in the summer. Today it 75° F and beautiful in Breckenridge. I expect more cool nights since the route pretty much stays above 8000 feet until the Wyoming border - only two days away now. 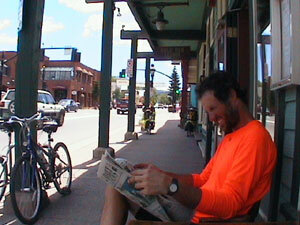 Immediately after having breakfast at a Conoco station (a typical breakfast on the road) we began to climb. The grades continue to be very moderate - it is about 2600 feet of gradual climbing from where we started to the top of Hoosier pass over a 32 mile route. There is still snow on the mountians here. It is amazing to imagine that in the middle of July after a dry winter that the snow pack has not disappeared. The white spots on the mountains are where the snow still lies. 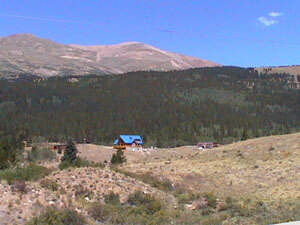 The first picture is looking west about 2 miles before the top of Hoosier Pass and the second is of the ski area at Breckenridge where there is still some snow on the summit. 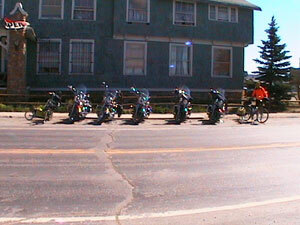 Joe and I stopped very briefly in Fairplay to take this picture of our hogs lined up with some puny Harley Davidsons. You can see my bike on the left and Joe is with his bike on the right. We met two other riders a few miles up the road in Alma. These two ladies were eastbounders and were happy to be over Hoosier Pass. They are pushing on to Canon City today which is a very strong ride. It took us two days to reach this point from Canon City but we were going up hill. They get to enjoy about 50 miles of mild to moderate descent. The ride up to Hoosier Pass was pretty trecherous. The traffic was moving very fast and there was no shoulder. The ride down was very, very fun and far steeper than the climb up. I pretty much coasted from the top of Hoosier Pass all the way down to Silverthorne, a 25 mile descent. The first picture is looking back on Alma about three miles from the top of the pass and the second is a shot of me on top of the pass with my bike. We met up with a very large group of riders who were on a benefit ride for Habitat For Humanity on Hoosier Pass. They are cycling from Connecticut to Los Angeles along a much different route. Although they were westbound they came over Hoosier Pass the other way. Each of the 50 cyclists was riding a Cannondale bike that was given to them and they had a substantial sag wagon and maintenance service. Each had to raise $3500 to make the trip happen and they have stopped to help build four homes along the way so far. Breckenridge, Frisco and Silverthorne are resort towns that cater to tourists. Things are expensive here but not as expensive as they are during the winter ski season. Hotels and restaurants jack their prices up from October until the end of the season. 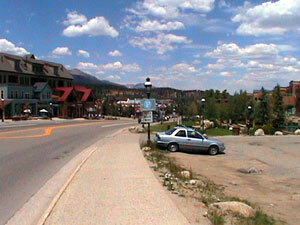 The first picture looks down the main drag in Breckenridge and the second was taken at the place where we ate lunch. You can see our bikes at the end of the sidewalk. 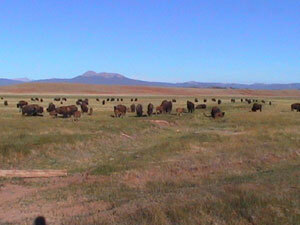 There is an extensive network of paved bicycle trails that meander through this area. 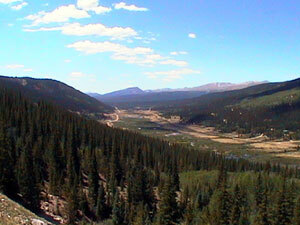 We rode on a trail from Breckenridge to Silverthorne that was very nice for the entire fifteen mile stretch. Sometimes navigation is tricky because there are so many trails! I was in a bike race today. 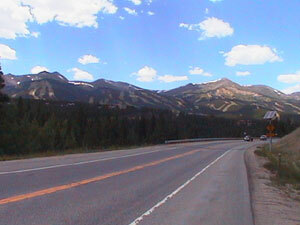 There is a 125 mile ride in the Colorado Rockies that we caught up to on the bike route between Breckenridge and Frisco. Joe and I were passing people on racing bikes going up hills. It made me feel good to be able to haul a 70 pound trailer up a hill faster than some guy on a light racing bike. I passed about 30 of them in a five mile stretch of road and wasn't riding any harder than I usually do. Perhaps bicycle touring is a good way to train! I think we made some of them feel bad. Here are some other miscellanous pictures. The first is my dream home - a log cabin high in the Rockies. 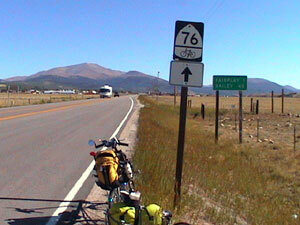 The second shows a TransAmerica route sign about one mile before Fairplay, Colorado. I saw these signs extensively in Virginia but didn't one since the one I saw yesterday. They are placed sporatically here in Colorado. Perhaps other states will have them too. I'm staying in the Alpen Hutte (pronounced Alpen Hoot) hostel in Silverthorne tonight. It is very expensive for a hostel but much cheaper than the hotels in the area. The campsites in town were full and they didn't have showers. There is laundry and heat here in the hostel - it will most certainly be a chilly night again tonight. 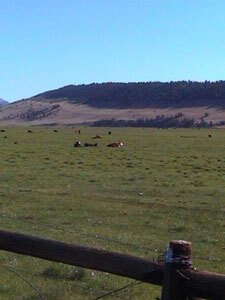 Tomorrow we will shoot for Walden, Colorado which lies just 22 miles south of the Wyoming border. 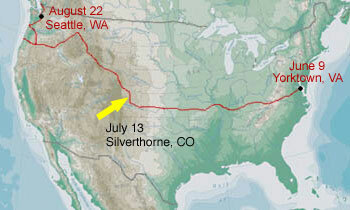 Wyoming will be the seventh state on the journey. I'm still ahead of schedule by about 210 miles and if we make it to Walden I'll be over 240 miles ahead of schedule.